Cells do not live forever, and they will reach a point where they will divide through mitosis, or die through a process called apoptosis. Cancer cells are the exception, these cells do not die and divide uncontrollably as they crowd out healthy, productive cells. Cancer can have many causes, but most are thought to be related to carcinogens in the environment. Carcinogens are chemicals that can damage DNA and interfere with a cell's normal cycle, thus disrupting the cells ability to control when and how often it divides. While most cells do not live forever, cancer cells do continue to divide as long as they are provided with nutrients. Research has been conducted for many years on an immortal line of cells called HeLa cells, named after Henrietta Lacks, who was a female with cervical cancer. All HeLa cells are derived from the original sample taken from her when she was a patient in 1951; Henrietta Lacks died that same year. Cancerous transformation results from changes of the DNA and the genes that control the cell cycle. Two types of genes normally control the cell cycle: proto-oncogenes, which start cell division and tumor-suppressor genes which turn off cell division. These two genes work together, one turning on cell division when the body needs to repair or replace tissue, and the other turning off cell division when the repairs have been made. If the proto-oncogenes become mutated, they can become oncogenes, genes that lead to uncontrolled cell division. Mutations in the tumor-suppressor genes result in the cell not having the ability to turn off cell division. Oncology is a branch of medicine that deals specifically with cancer. When a cell becomes cancerous, it develops traits that normal cells do not have. 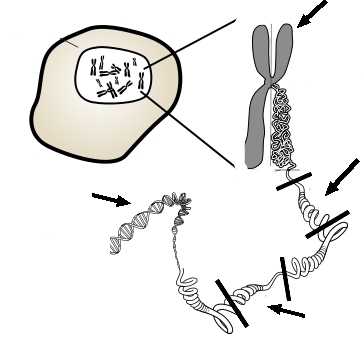 For instance, a cancer cell can have unusual number of chromosomes due to incomplete mitosis or cytokinesis. Cancer cells may be abnormally shaped or larger than normal cells. Cancer cells also can lose their attachment to nearby tissue and travel to other parts of the body, where they continue dividing and causing problems at other locations. Secondary growths of cancer at a distance from the primary site are referred to as metastasis. Once a cancer has metastasized, aggressive therapies may be needed to treat the disease. Cancer cells take essential nutrients from the blood to grow and divide and crowd out other cells that have important jobs. In the case of leukemia, white blood cells grow uncontrollably and crowd out the red blood cells, thus reducing an individual's ability to deliver nutrients to the body and affecting the blood's ability to clot and repair wounds. 1. Compare the role of tumor suppressor genes to proto-oncogenes. 2. What are HeLa cells and why are they important? 3. What is the relationship between carcinogens and mutations? How does this in turn affect the development of cancer? 5. In 1951, cells were taken from Henrietta Lacks and used for many years in research. Henrietta did not give permission for her cells to be used, the law did not require that. These cells have been used in over 60,000 research projects, but Henrietta's family has not received any compensation for contribution to the research. Do you think the law should be changed? Should people be compensated for donating their cells to science? 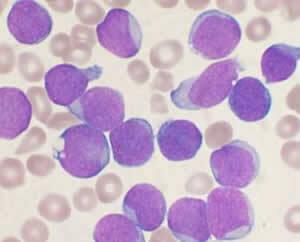 "Acute leukemia-ALL" by Original uploader was VashiDonsk at en.wikipedia - Originally from en.wikipedia; description page is/was here.. Licensed under CC BY-SA 3.0 via Wikimedia Commons. \ This work is licensed under a Creative Commons Attribution-NonCommercial-ShareAlike 4.0 International License.